Me too! Please fix this, Vikings. Also I can't open the 50 gem kickoff chest. What ?? No way there's another gem event?? I was charged 5 YoCash too. the gem event? guess I am lucky mine won't open! sorry that happened!! Charged me 5 yc as well for "free" room. Odd, I'll get the team to fix that. LisaTM (10095126) wrote: Me too! Please fix this, Vikings. Also I can't open the 50 gem kickoff chest. I was just about to claim it when I saw the 5yc was not crossed out like normal, and cancelled - figured Id check here first, aaand I was right to cancel! Viking David wrote: Odd, I'll get the team to fix that. Last edited by Bookworm J (129336295) on Mon Feb 11, 2019 5:07 pm, edited 1 time in total. 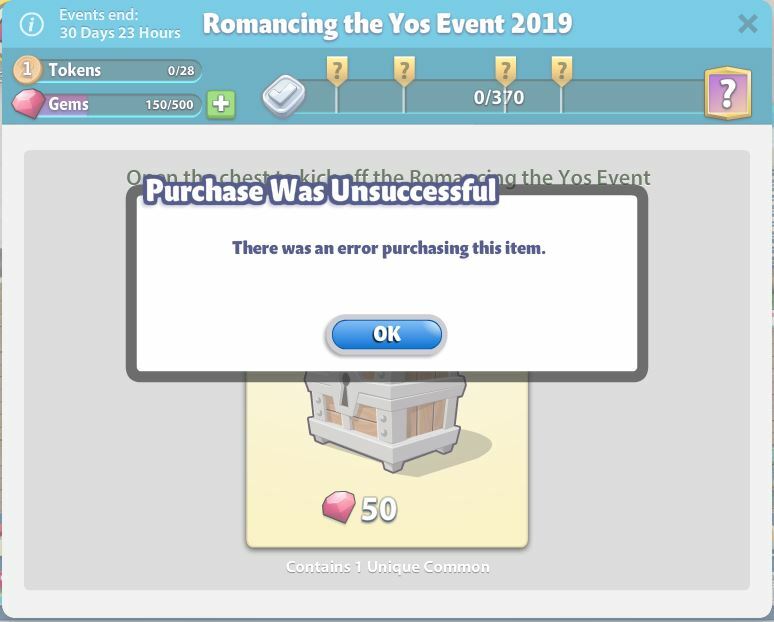 I was charged 5yc for the free room and it wont let me open th first chest for new gem event. Same here, I just filed a ticket. Looks like there's a glitch with the kick-off of the new gem event. Last edited by Shawna (105491607) on Mon Feb 11, 2019 5:09 pm, edited 2 times in total.